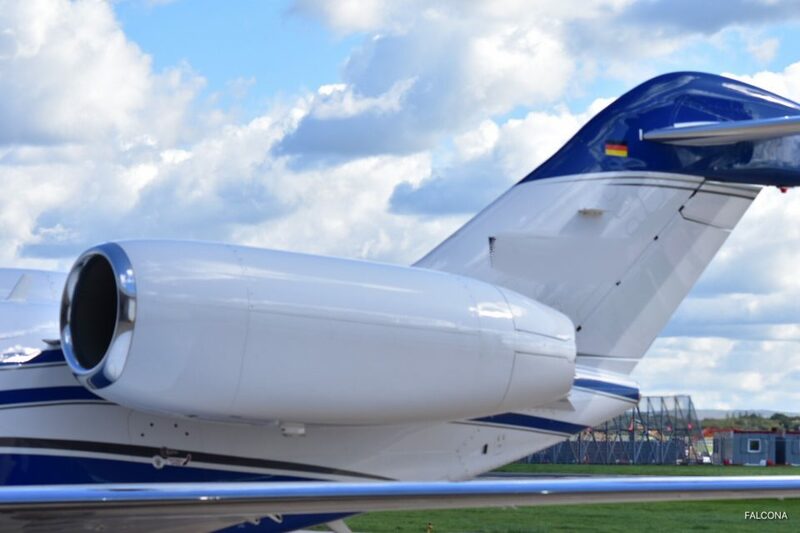 Charter the Cessna Citation X with Falcona for your next business or leisure trip. The Citation X travels just under the speed of sound. Inside the Citation X’s cabin—more sleek and aerodynamic than any other private aircraft in its class—you’ll find comfortable leather club chairs. With its powerful combination of comfort and performance, the Citation X is an aircraft you need to experience for yourself. 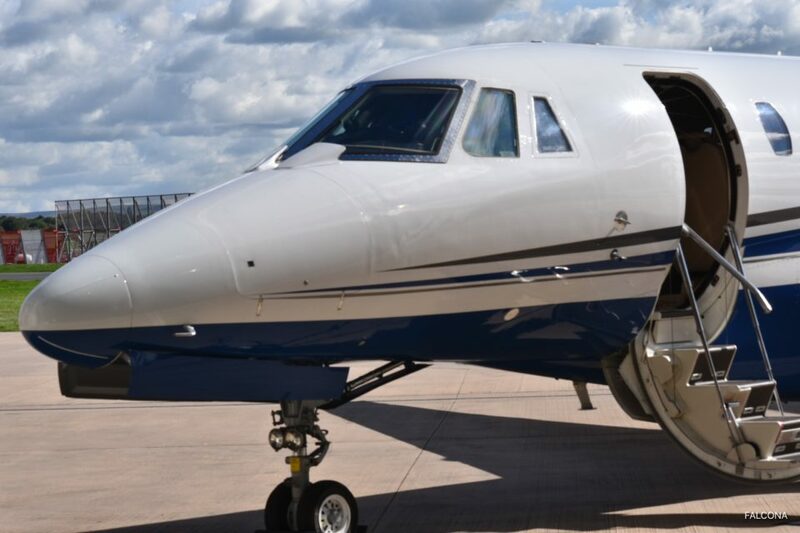 Classed as a super mid size aircraft the Citation X is a very good choice of jet for passengers looking for speed and comfort. 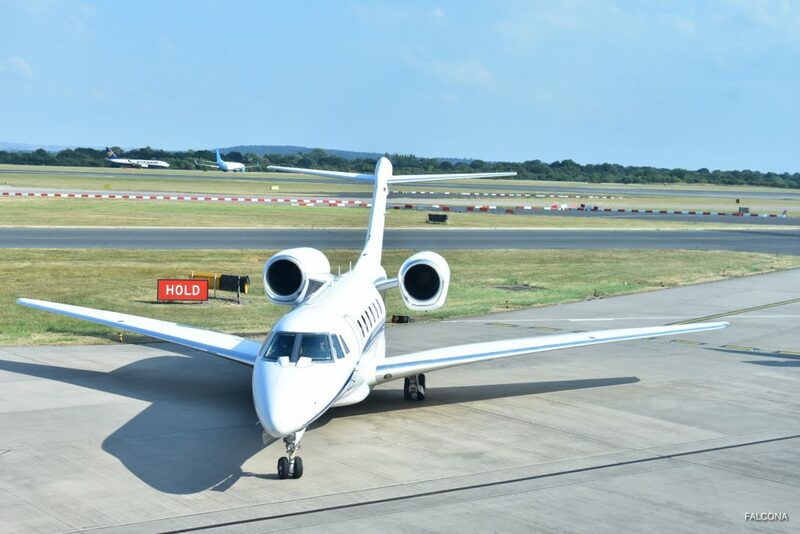 Capable of flights ranging up to 6 hours, making flights from Manchester to Gran Canaria and Tel Aviv with ease. Two Rolls Royce AE 3007C engines with dual-channel FADEC (Full Authority Digital Engine Controls) power the Citation X, providing the aircraft with the ability to travel faster and farther than other mid and super mid-sized aircraft. Through computer monitoring and control, the FADEC systems precisely manage the engines, executing flights with maximum efficiency without exceeding operational limitations. The Citation X is truly a versatile jet that can handle both short trips and international flights with unrivalled performance. With the combination of radically sweptback wings and high performance wings, the Citation X is able to achieve unparalleled overall performance. No other business aircraft is able to reach the high altitudes and speeds of the Citation X while also maintaining stability at slower speeds. With the addition of elliptical winglets, the aircraft is more aerodynamic and experiences improved hot day, high altitude performance out of mountainous locations. Measuring 4’6”(h) x 2’1”(w), the doorway provides ample room to enter and exit the aircraft with ease. 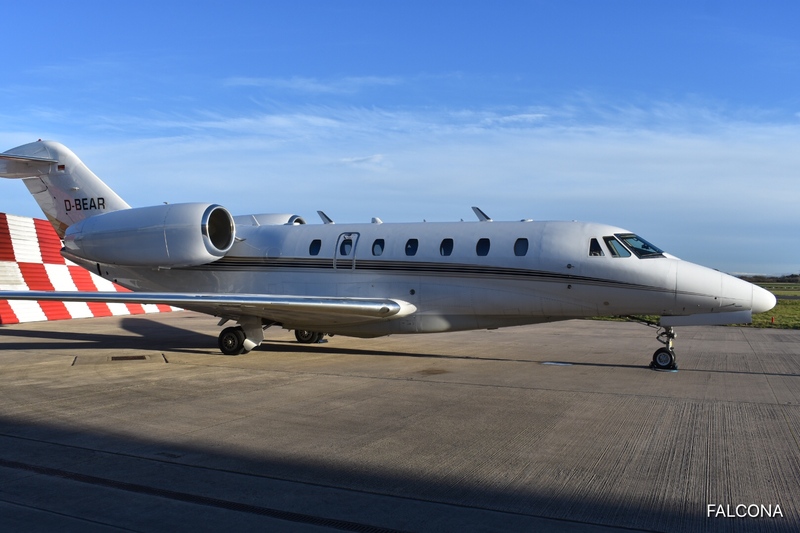 The Citation X includes a solid staircase with steel handrail that gracefully swings down, allowing passengers to board the aircraft feeling steady and balanced. The Citation X luggage compartment can hold up to 72 cu ft of baggage. with such an enormous space, you can keep your cabin free of excess storage and bags. The external compartment is heated and pressurised to keep your stowed belongings safe while in flight. 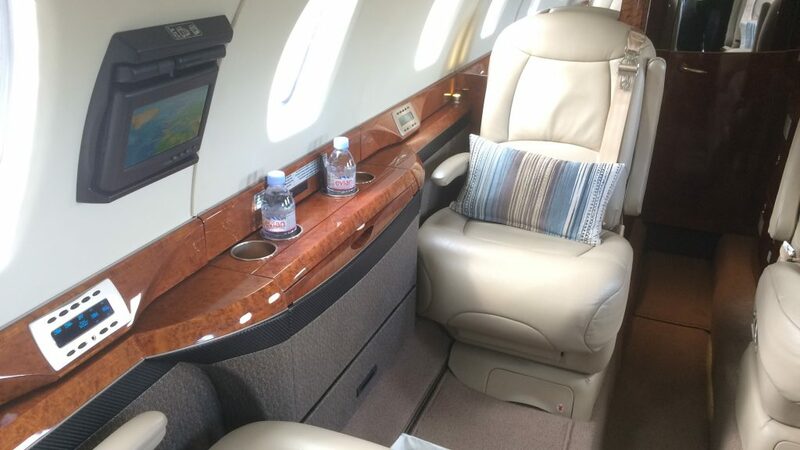 As soon as you step inside the custom cabin of the Citation X, you will quickly notice the opulent amenities and lush seating accommodations. All passengers on-board will enjoy more space to relax for the duration of the flight. And with leading edge technology features, you can continue streaming, downloading and sending data from 51,000 ft. The double club configuration provides extra space for passengers inside the cabin. The Citation X boasts one of the widest, most spacious interiors in its class. The design provides built-in head and shoulder room, creating an airy, open space. Conduct a meeting or just sit back and relax in a cabin that provides more comfort and workspace for all passengers on board. A total of four tables easily fold out between the facing club seats. With a simple touch of a button, the tables deploy, providing ample space for dining or work. When finished using one of the table tops, simply slide it back into the sidewall for more space to relax. The seats in the Citation X were designed with your inflight comfort in mind. Each seat is extremely plush with overstuffed, wide cushions for maximum relaxation. Due to the long range capabilities of the aircraft, it’s important for our clients to be comfortable for the entire duration of the flight. Affixed within the full service galley is a microwave/ convection oven to keep your catering orders at the perfect temperature up to the last bite. The sleek cabinets are always stocked with your favourite in-flight food and drink. The galley with full refreshment centre features beautiful crystal stemware for your special occasions, as well as hot coffee and water for tea to help you feel right at home. There is also ample storage to keep your personal selection of beverages cool and at hand. In-flight convenience has been redefined by the Flight Options Citation X. 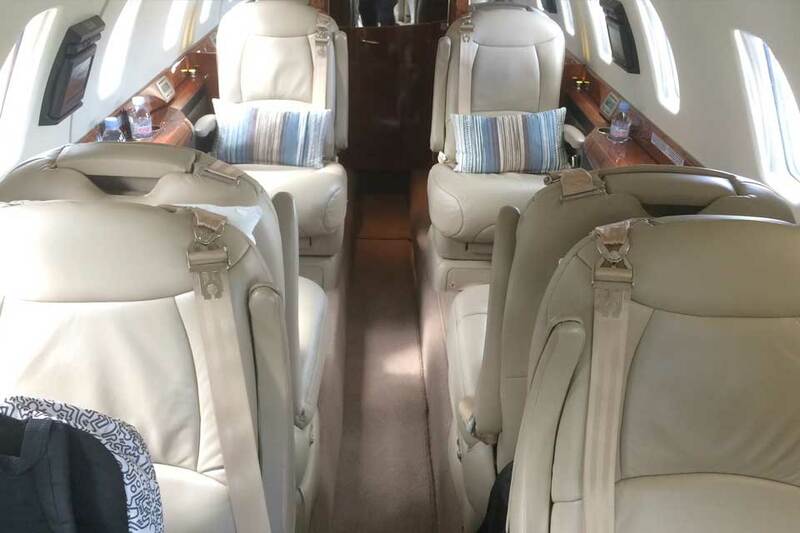 Whether you are looking to relax or stay productive, the Citation X features on-board Wi-Fi connectivity to stay logged-on while en route to your destination. Enjoy the ability to continue streaming, downloading and sending from your wireless devices as if you were still in your office. The cabin also offers data ports if you choose to directly dock in. To keep passengers entertained for the duration of the flight, there is a CD/DVD player with audio speakers and headsets throughout the cabin. Multiple displays are located in the cabin for AirShow moving map systems or for entertainment. Also included in the cabin is a telephone and power outlets located along the sidewalls, so you can charge your devices and arrive with full power. 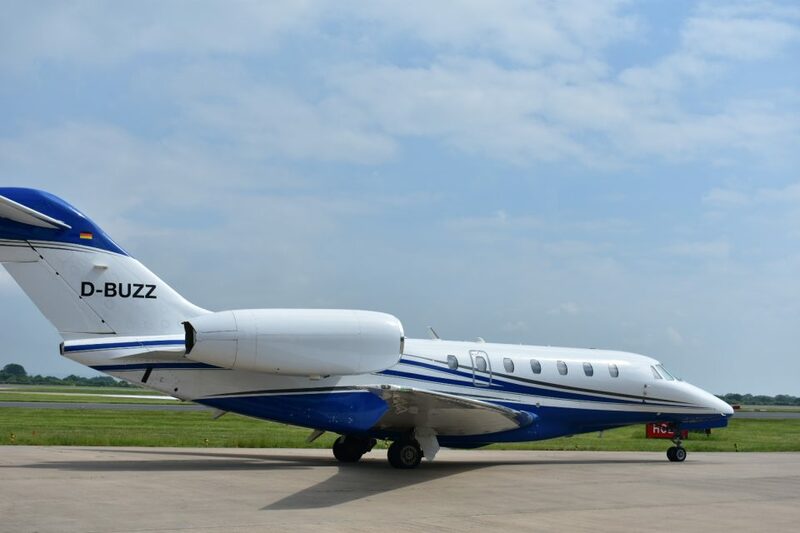 The Citation X is capable of climbing to to an altitude of 51,000 feet with ease, flying higher than all other business aviation and commercial air traffic. Avoid in-flight turbulence by flying above adverse weather conditions that may occur, providing an all-around smoother flight.